Now that Richard III has been laid to rest, and his tomb is open to the public for viewing, what more is there left to see when you’re in Leicester? Plenty. Across the street from Leicester Cathedral, Richard’s final resting place, lies the brand new, state-of-the-art, King Richard III Visitor’s Centre. Built only two years ago, around the spot where Richard was discovered in September 2012, the centre boasts an impressive array of items from the dig and Richard’s time to provide visitor’s with a fantastic retelling of Richard’s tale. The centre was built on top of an old grammar school that moved out of the building in 2008. The grammar school stood on the remains of the medieval Grey Friars church where Richard’s remains were hastily buried over 500 years ago. The location has been converted into a spectacular museum dedicated to Richard’s life, death and discovery. The museum is a nice mix of modern technology, archaeology and traditional storytelling. It makes Richard’s life and times accessible to the modern visitor who might not be well versed with the War of the Roses, Richard III, or the Middle Ages. There is plenty about the science behind the discovery, from replications of the skeletal remains, detailed facial reconstruction, to a digital display that shows visitors which weapon made the wounds that ultimately caused Richard’s death. All in one spot, you can learn about his armour, the weapons of the time, and DNA testing methods. It’s a fascinating, well put together exhibition. In addition to the scientific end of the centre, there are video re-enactments using actors in period costume to talk about Richard’s life and politics. Audio and video were also implemented to recreate the sites and sounds during the Battle of Bosworth in August, 1485. There is of course, a large scale archaeological component to this museum. The upper level hosts a fascinating dig diary where you can see the step by step process the dig team went through to find Richard from the tools they used, to the paperwork involved, to Philippa Langley’s boots, down to the hard hat and construction gear worn by archaeologist Matthew Morris. 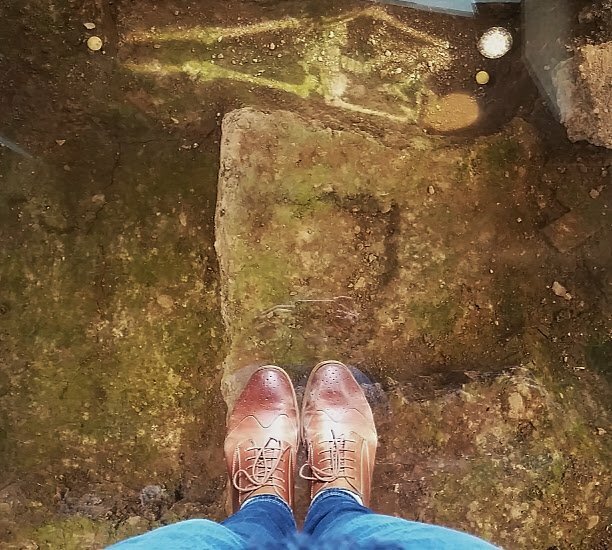 Your visit ends at a glass floor, where you can stand over the exact spot Richard was found! An intermittent light shows a skeleton so you can see how his body was placed in the grave. After your visit is done, you can enjoy a rest in the café and grab a drink and a snack. There is lovely outdoor patio seating available if the weather permits. Afterwards, you can peruse the gift shop where all manner of corny, and kitschy Richard paraphernalia can be found. I couldn’t resist and ended up coming home with a CarparKING mug. What can I say? I needed a laugh with my morning coffee. It is extremely apparent that there has been a lot of time, effort and care invested in this museum to make the experience truly enjoyable. It’s interactive, accessible, and modern. It tries its best to get the visitor engaged with the Richard’s story and is well worth a visit if you’re in Leicester to see Richard’s tomb. The Visitor’s Centre is across the street from Leicester Cathedral so it’s a matter of a few steps to pop inside and see this fantastic place. Tickets can be pre-booked easily online, or bought in person. For £7.95 you can spend a few hours enjoying a look at the discovery and history behind one of England’s most controversial kings.